When you’re busy casting your fly, you don’t want to worry about your net. That’s why you’ll appreciate this magnetic net release from Piscifun. It keeps your net out of your way yet close by & ready when you need it. Ultra-strong Magnets – 2 super-strong magnets that close tightly, ensure your net stays safe & secure, even when you’re wading through brush & thickets. 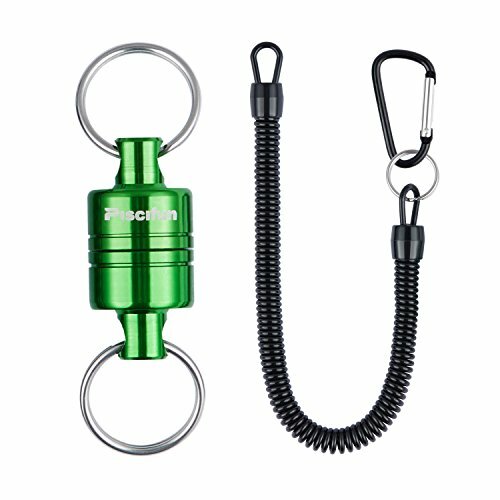 Sturdy Carabiner Clip – A handy carabiner(our exclusively), so you can easily clip your net to the D-ring on your vest, pack or boat. A Retractable Coil – A bungee coil which can extend to 59”that keeps your net safe. Super easy to land your fish and never worry to lose your net or other fishing gear. Durable & Convenience – Premium magnets offer exceptional strong power to keep your stuff safe. 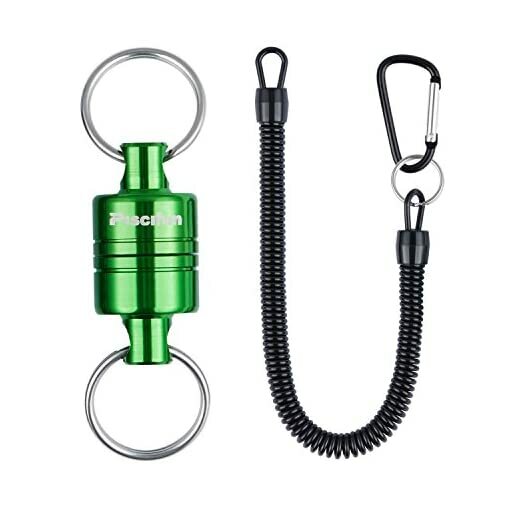 You can also use it with fishing pliers, nippers & other tackles. Decent Package – A great fishing gift for all anglers! Ultra-strong Magnets – Up to 7.7lb magnetic power. 2 super-strong magnets that close tightly, ensure your net stays safe & secure, even when you’re wading through brush & thickets. A Retractable Coil – A bungee coil that keeps your net attached & expands up to 59”. It easily catch your fish and never worry to lose your net or other fishing gear. Warranty – 100% Satisfaction Guaranteed, you have no worry to try Piscifun magnetic net release.